This Electronic Board is the original Board for the Miracle Gate Opener- There are 2 style of board this one is to operate a Dual / Double Arm Gate System. This Electronic Board is the original Board for the Miracle Gate Opener- There are 2 style of board this one is to operate a Single Arm Gate System. 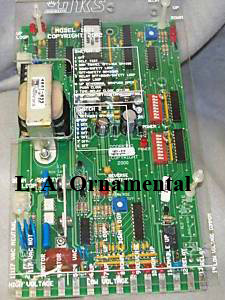 This Main Circuit Board took the place of the PRB2 and the PRB3 This Electronic Main Circuit Control Gate Board were found in the older Model of Power Master Gate Openers. The PRB3 was re-place in the newer models but now are also discountinued and have been replace by this new board the PBRSS.if your operator is equipt with the PBR2 OR the PBR3 then this board is the one your opener needs. Power Master Main Control Board this board are use in the P1500 Barrier Gate Openners and the P5000 Gate Operators. This Power Master Main Control board is found on the large Gate Operators, Most of the Commercial Gate Openers have this Circuit. Look to make sure that that you order the correct Board. The GSMCB01 look almost the same as GSMCB02 but the GSMCB01 is for the most part for the commercial units. This Power Master Main Circuit Control Board Model # SS7 OR SS7-C is still available and use in some door products. The SS7-C is for direct motor drive applications (NO CONTACTOR). The "Intelligate" features: Reprogrammable microprocessor: Allows control boards to be updated. LED diagnostics: LED (red lights) show the status of the control board at all times. 3-Button station: Easy connection plug (included) for 3-button stations. Status relays: Triggers relays when the gate is fully open or fully closed. Plug-in loop detectors: Allows ILD-24 plug-in loop detectors (sold separately) to be used, eliminating messy wire connections. The control board is powered by a 24VAC transformer (sold separately). This allows no necessary board modifications between 110VAC and 220VAC single-phase applications.